Monday night, I and three-hundred or so other people attended another meeting to discuss the “growing” crime problem in the areas of Long Neck, Angola and Oak Orchard. The previous meeting for this purpose was also well attended, but took on a completely different tone. At that meeting, the public got a glimpse of the organization calling itself, “Long Neck Strong” . I have to say, I really have a problem with this name. It seems as though it is a play on “Boston Strong” , which was a phrase which came about following the Boston Marathon bombing. It’s not that I feel they don’t have a right to feel concerned, but as far as I know, no bomb has been set off on Long Neck. It seems like a bit of an over dramatization. Back to the meetings. 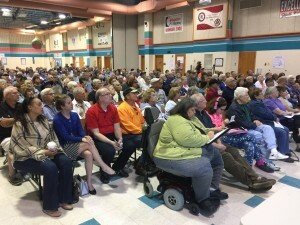 The first meeting was marred by people in the audience shouting angrily at the people who put on the meeting, the same people who organized this second meeting, Representative Ruth Briggs-King, Senators, Gerald Hocker and Brian Pettyjohn. This second meeting may have been a disappointment to the news media and those who were expecting a repeat of the first circus. This meeting was orderly and respectful, and seemed to have been organized by Sen. Pettyjohn, at least he was acting as the moderator, and instead of questions being shouted from the seats, questions had been written and submitted for reading. A little background on all of this, is that following a news story about a local business, Kickin’ Chicken being broken into for the thirteenth time, let me write it this way so you can understand, 13th time, the owner decided to close that particular store. This got coverage on local talk radio station Delaware 105.9, with Dan Gaffney taking the lead. It was after all, a good story. Business owner too lazy, or too cheap, to put in an alarm system, or cameras at the very least, and who kept cash in the walk-in freezer, and the key hidden in the same place, feels put upon by the growing crime in the area and closes. This story brought many callers to the station, telling of the out of control crime in the area, with many relating personal stories of being robbed and witnessing drug deals at local convenience stores. The cry was, growing crime and not enough police and an epidemic drug problem. This narrative was replayed at the first meeting, and again in a more adult fashion at the second meeting. I did not attend the first meeting and could only follow the story through local media sources, which played up the citizens anger and fear over the growing crime, and the lack of response from elected officials, and law enforcement. I am not aware if any law enforcement officials were at the first meeting, but I can tell you there were about ten officers from the Delaware State Police in attendance Monday night. In fact, one might consider, if Long Neck could get ten officers in the area on a regular basis, it might have an effect on the growing crime problem. Okay, somebody go back and count how many times I have written “growing crime problem”. I ask because this has been the narrative in the local media, and from the Long Neck Strong people, and anybody you ask about the area. You would think there is a break in every half an hour or so. Though there has been a rash of robberies at businesses in the past weeks, most likely by the same person, but time will tell. This meeting last night, from the perspective of the elected officials and the law enforcement who were present, was to inform the citizens of some facts, which likely did no calm the fears of many. The state police provided a power point presentation of crime data for the Long Neck area, which showed over all, crime is down over the past five years, with slight up ticks in drug crime, and burglary, which percentage-wise could be due to the most resent rash. The state police demonstrated that while these two areas have seen an increase, it certainly was not the epidemic of crime which the media and the citizens themselves had been portraying. The people in attendance were assured, while they may not always see a marked car in the area, they could rest assured the state police were there. Often in unmarked cars and even undercover operations to fight the drug crimes. To be honest, one might conclude the reason this meeting was calmer, was because this opening presentation may have acted as a sedative. Yawn! But the data does not lie. The most telling moment of the night was when Sen. Pettyjohn asked the audience to raise their hand if they hand been a victim of robbery. About five or six hands went up. Then Sen. Pettyjohn drilled down and said, “in this area” meaning Long Neck, and all of the hands went down. What does this tell us? Well it tells me, the people who were concerned enough to come out on a Monday night, who obviously have fears about the crime in their community, are basing these concerns and fears on something other than personal experiences. Is it possible all of those “drug deals” people think they are seeing at convenience stores are not all drug deals, maybe some are something more innocent. I know I have personally met my niece on several occasions to give her cash, we even joked someone would think it was a drug deal. Is it possible people are afraid because they hear other people saying they are afraid? Mass hysteria is real. So the question is, is the fear causing the hysteria? Or is the hysteria causing the fear. Or! Is there something else at play here as well? Is it possible some within the community have their own reasons for ramping up, what is not what it has been made out to be? I have noticed two things beyond just concern about crime in the area. One is, SCAAG (Sussex Countians Against All Growth) seems to be raising its ugly head. Many of the people who say they are concerned about the crime in the area, have started saying we need to stop all the development until the problem is solved. Second, there seems to be a political aspect to this. It is not unusual, when people are upset about what they perceive as inaction, they tend to lash out at elected officials. They feel government is the answer, and if government is not solving the problem, then it must be because the person in office is not doing their job. There has been some anger aimed at elected officials in general, and at two in particular. Sussex County Councilman, George Cole, for not showing up at any of these meeting, and at Rep. Ruth Briggs-King. Rep. Briggs- King is taking a lot of the heat. She has been criticized on other occasions about the flooding issues in the area, and now about a lack of action beyond holding meetings. Full disclosure, Paulette Rappa who has run against Briggs-King twice, is also a member of Long Neck Strong. I’ll leave that right there for now. It may seem as though I am minimizing the concerns of the people who live in the Long Neck area, I am not. They live there and have a right to feel secure in their homes. However, I do believe this has gotten slightly blown out of proportion. The cry for more police and more spending on the part of the entire county and state, at a time when money is tight, needs to be based on real facts and data, and not on unsubstantiated fears. At the end of the meeting, which ended abruptly, with Rep. Briggs-King quickly stepping to the mic and announcing the meeting was over, I canvassed the room asking people what they felt about the meeting. Most stated, while they felt they had gotten information, they had not gotten answers to what would actually be done. Most still held to the belief it is, the so-called drug epidemic, which is driving the “growing crime” problem. There I did it again. One positive point which may come from this interaction between the citizens and law enforcement, is the creation of citizen watch groups, ways for people to deter crime, like more lights and dogs, and a better communication between the people and police. 8 Comments on "Long Neck Crime Meeting"
I wouldn’t pay much mind to the name “Long Neck Strong”. I believe it’s a common meme that came from the “Lance Armstrong Foundation”, which changed it’s name to the “Livestrong Foundation”. People use the “Strong” meme for many causes today. It seems to represent healing or a comeback against the odds. I have a friend who’s daughter is recovering from a devastating riding accident, and there have been all kinds of hats, bracelets and t-shirts made with the “strong” meme attached to her name. It’s not that I feel they don’t have a right to feel concerned, but as far as I know, no bomb has been set off on Long Neck. It seems like a bit of an over dramatization. Why do you put such an emphasis on the trivial? Who cares what they call themselves? What is the security situation at the Kickin Chicken at Five Points? How many times has it been robbed? ….which likely did no calm the fears of many. “…no calm?” This renders your post moot. Sort of like misspelling Kuchner. However, I do believe this has gotten slightly blown out of proportion. Maybe so, but you don’t live there, do you? So you don’t know, do you? For example, how many crimes go unreported, and thus, are not included in police statistsics? How many criminals are just loitering around, but can’t be arrested for just hanging out? The criminal element moves about. As neighborhoods become gentrified, they are displaced and go elsewhere. They need a cheap flop; Long Neck is the new criminal resort. The people of Long Neck need to be armed. The cops investigate crime, they don’t prevent it. She needs to be armed ? I said the people of Long Neck need to be armed. If you are afraid of guns, don’t own one. Rick asked, “For example, how many crimes go unreported, and thus, are not included in police statistsics?” First of al, we seem to be trading misspellings. But if a crime goes unreported, whose fault is that? And is it really a crime if the victim did not feel the need to report it? If a tree falls in the forest and no one is there, does it make a sound? Well Rick as I am sure you know, the location in Lewes is in a small strip mall, at a very busy intersection and well lit, with a liquor store next door which means fairly late hours. The location on Rt. 24 is a stand alone building, set back from the road slightly, not sure if there is any lighting on the property itself. So if the owners is not aware enough to see the different circumstances of his two locations, and take appropriate steps to protect himself, then he is partially to blame. 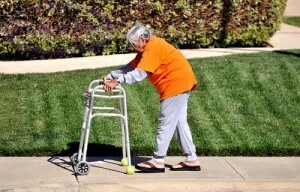 What is a woman getting around with a walker gonna do with a gun ? When I said “the people of Long Neck need to be armed,” I didn’t mean every man, woman and child. I meant those that wanted to exercise their God-given right to protect themselves, their families and their property. Chicago, Baltimore, Wash DC- and Murder Town- all have draconian gun control laws. How is that working-out? But if a crime goes unreported, whose fault is that?